Ben Affleck directed and starred in this film, which I expected would result in a bad film. Not since the days of Dogma has Affleck been in anything relevant and we’ve had to muddle through the likes of Pearl Harbor, Daredevil and Gigli. The Town opens with a tag line of “one blue-collar Boston neighborhood has produced more bank robbers and armored car thieves than anywhere in the world.” It then cuts to a high pace action scene and never really let’s you down from there. 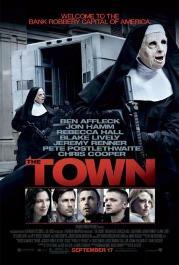 Filmed in Affleck’s home town, the cinematography makes Boston seem like a character in the film. Affleck plays a dropout NHL player with anger issues who turns smart aleck bank robber. He and his gang take a hostage from the bank (Rebecca Hall) whom Affleck later falls for. Their relationship is the main arc of this film; Affleck trying to dodge the police and get out of the “game” while Hall tries to cope with the stress of being kidnapped. The film really shines most through the supporting cast. Jeremy Renner is great in his crazy but loyal gangster friend to Affleck. Blake Lively, Affleck’s sister in the film, also gives a top notch performance. The emotional scenes are genuine and have more than enough weight to carry you through the amazing action sequences. The film could have done without the cheesy ending but overall the film falls into a definite “must see” category.